Van equipped with trolley, straps and blankets. Please book now to secure availability. Incredibly helpful and genuinely nice man, Made the move extremely easy and enjoyable. Not more could be asked for. Professional and personable. Fantastic service, really friendly and helpful driver, quick and painless process! Very helpful, down to earth person. Really nice and professional guy. We would recommend him to our friends. Thanks, Russ! Russ was on time and very polite and was helpful in loading and unloading the van! He was careful with all my belongings and had a nice little chat in the van as he drove. Russ was very professional and friendly and this all made for a very pleasant moving day! Keep up the good work Russ! Excellent service. Clearly appreciative of the issues that come with moving, and very ready to help with all the details. Will surely contact again when I next move! Russ managed to help us get a giant sofa through five doors and up two flights of stairs! Really nice guy too. Russ helped us to efficiently transport our items - he arrived on time, was very helpful and called to confirm once the delivery had been completed. Would recommend and use again. Really helpful and flexible. Made our move very easy and efficient! Would recommend. Thanks! Excellent service. The driver and his helper were in time, very polite. Proactive and willing to help. Will definitely recommend them. Lovely guy and made the move seamless! Highly recommend Russ! Russ was great. Really helpful - he took the old bed away. Helped us move all the stuff into the flat. Really great to work with and amazing he could help at such short notice! Absolutely nothing to complain about. Russ was so pleasant and helpful , we would not hesitate to recommend him to anyone and would use him ourselves for any future removal. I can only say that we were totally satisfied with our experience. Thank you Russ. Driver was great, very helpful and flexible. Our driver Ross was fantastic. He called to confirm he was on his way and helped us out even when we didn't select to have assistance. Really great service, I would recommend him. Russ was amazing! Thank you for a stress free move !! Russ was fantastic - made very easy work of the move. I would highly recommend him - I chose him because of the ratings I saw on here and he more than lived up to expectations. On time, helpful, prepared, even gave me a pair of gloves so I could get a better grip when we were loading. I would definitely use Russ again and recommend him - thanks Russ. Very friendly and polite. I got everything from A to B I needed to quickly and safely. Very prompt and very friendly. I would recommend! Very polite. Would use again. Very helpful , respectable and made our move 100% easier???? The driver was very polite, helpful and respectful. He also helped carry heavier items up to our 2nd floor flat on his own accord, even though we had not chosen the option of the driver helping out. Would recommend him. Incredibly prompt, great communication from the driver ahead of the date, and he was very helpful and courteous on the day. Would highly recommend. Very quick and punctual, totally recommended! Very polite and professional service. Highly recommended. He was great. Punctual, hugely helpful and friendly. The whole process was far easier and faster than expected. Highly recommend. Russ was great - very friendly and great service ! Thank you! Really professional, on-time, super quick and easy. Very helpful, respectful and on time. Would definitely recommend. Russ was great! He called when he was going to be a few minutes late due to traffic but this was no issue at all and he kept me well informed. He also assisted with moving my items and putting them into the truck when my helper was running late. All of my items arrived safely with no damage and Russ also assisted when unloading the van at the drop off location! I would definitely use Russ again!! Russ was so helpful, friendly and professional. He was on time and very patient in clearing out my flat. The drive was wonderfully smooth and we had an enjoyable chat! I had to change the moving address last minute and this was no problem. I can only recommend Russ, and will definitely call him the next time I need to move. Russ was 10' late as the flat entrance was a bit hard to reach. I had a helper with me and everything went quite smoothly. He drove us from London to Cambridge and knows the route very well. I would recommend him. Russ was very friendly and made the move so easy and stress free. Would recommend without a doubt! Russ was really helpful and friendly. Would definitely recommend to anyone! Russ was super kind and professional, making the moving experience smooth and easy. Already recommended 2 other friends to get in touch. Thanks again Russ! Russ was very accommodating and even offered to arrive early. He was friendly, careful and extremely helpful. The am was also a great size and a well equipped for any move. I would highly recommend! Very corteous, very helpful, I would definitely recommend. Russ was very professional, handled my furniture with care, nothing was too much for him. Also very friendly. A very hard worker I would use again. The driver arrived early, was friendly and helpful. Would highly recommend and use again! I booked with Russ on the basis of how good the reviews were for his service and he really did make my house move go as smoothly as possible, during quite a stressful time. Russ was very friendly, helpful and handled all my belongings with great care. I couldn't have done it without him! The driver was very professional & turned up early. Russ arrived a couple of minutes early so was ready to load the van as soon as our time started. He was polite, helpful and able to load the van very neatly. The whole process was quick and painless and I wouldn't hesitate to call Russ again for our next move. Many thanks! Russ was lovely and very helpful. Would definitely recommend him and will use him again when I next move. Russ was very helpful and polite. Would definitely use him again! Great service I was happy with everything! Helpful, friendly, hard working. Would recommend. Fantastic move - kind & helpful driver - really good fair price ! Brilliant man with a van & the move went so smoothly- thank you ! Ross was amazing! He helped us more than we expected, was so nice and got in and got the job done! Would highly recommend! Very friendly and helpful. He made the process a lot easier and quicker and is a nice guy. His van was large and he handled any fragile items with care. Would highly recommend! We apologise for this confusion but are pleased that your booking was completed without further incident. Russ was very helpful and everything went smoothly. Very disappointed though that there was no tail-lift which I specifically wanted. Lots of heavy items that my family had to heave up and down off the back of the van. Russ was extremely efficient and friendly. He was calm and organised and helped make our move to a new flat a stress free experience. We would definitely use again and recommend to anyone without hesitation. Really helpful, worked so hard on about the hottest day of the year! Wouldn't have got through the day without him. Our driver made a difficult move very easy and stress free. He knew exactly what he was doing. We ordered a medium van which was actually massive and more than we needed but still worthwhile for peace of mind. We traveled back in the van with him and had a lovely chat on the way. Highly recommended. I would definitely use this driver again. Nice friendly guy. Everything was fine. Highly recommended. Polite and very knowledgeable when it comes to packing and getting accross town. Would use again and highly reccomend to anybody after such a service. Really nice guy and an amazing service. Russ was incredibly helpful and friendly. Made our move very, very easy. Would definitely book again. Thank you! Excellent all round. Highly recommend. Very nice, careful and helpful driver. Will definitely rework with Russ in the future ! Great guy, knew exactly what he was doing and talked me through the whole process. Was polite and good to speak to, enjoyed the whole process. Highly recommend! Russ was great! Made our move so easy and seamless. Would recommend to anyone needing help to make moving less stressful! Russ was extremely helpful with our move. We would hire him again any time. Couldn't ask for a better service. Goes out of his way to make things easy as possible and make sure your happy. Russ was excellent, much recommended. Smooth and fast moving. The driver was helpful and provided a good experience. No issues whatsoever. Everything was smooth. Great guy and highly recommended. I was very satisfied with the service. Russ the driver was actually 10 min earlier than the normal time which I was very happy with that and also very polite and professional. Definitely recommend. Russ was extremely polite and patient...considering the amount of belongings I had to move.However he was late due to the tube strike and the roads being blocked. So the move took us more than expected but again he was extremely polite and applogetic also compensated me for this problem RMT caused. I am extremely happy with the service I received and will be using him again garanteed. Russ was very helpful and punctual, would recommend. Excellent- couldn't ask for more. He knew what he was doing, where he was going, was really friendly and considerate. Will definitely use him again! Russ was on time polite, helpful and friendly. I definately would recommend him to anyone. The hard move was made easy with his calm helpful deamener. Fantastic service!! He was a true gentleman and very patient. We highly recommend. Russ was very friendly and helpful. He advised us on how to move heavy items safely. We would recommend him highly! Great driver. I little more care with items would be nice but otherwise very helpful. Driver booked to arrive at 11.30am. called me at 11.30am (rather than before) to say he would be 30 mins late. Arrived at 12.15pm. 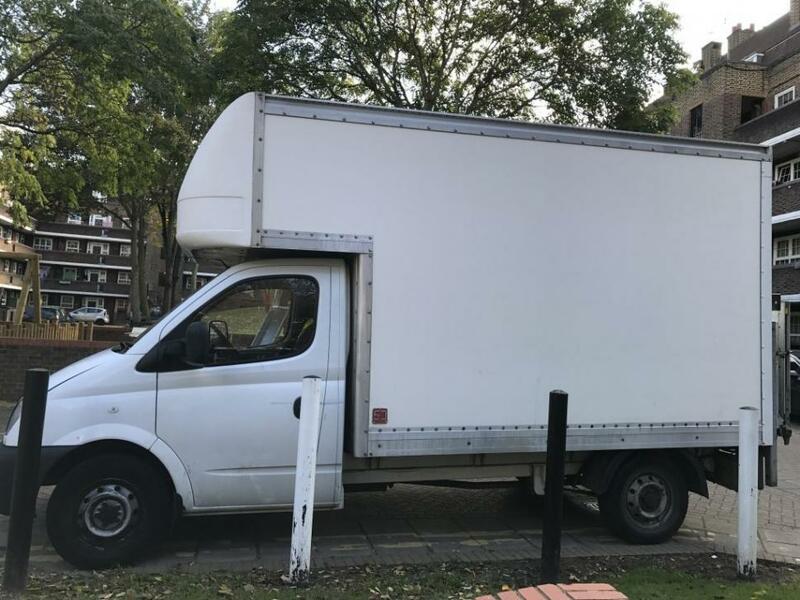 He was very pleasant but work rate was not exactly speedy and he did suggest that van was full/ overloaded and we'd need 2 trips when it really wasn't. Driver was friendly and helped out all the way. Very happy. The driver was very helpful, polite and supportive. Lovely big van with tail lift function that really aided the move. Driver proffesionaly assissted with the loading and unloading of my possessions as if they were his own, most apprieciated. Cost of the job was extremely reasonable.